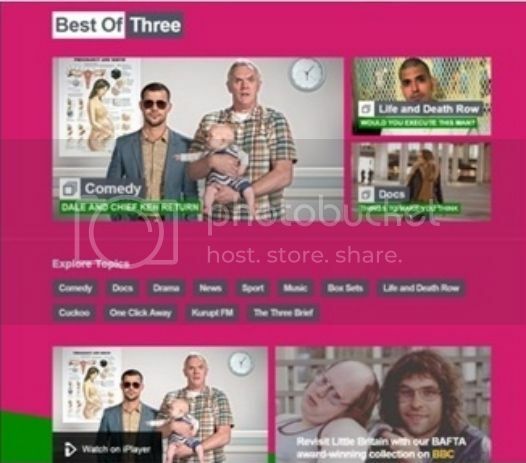 Home » Blog » What Happened to BBC3? Apologies for the two blurry pictures. These are my own screenshots and it turns out the system HATES my screenshots. Remember when my co-blogger and I were talking about non-linear forms of TV gradually starting to replace the traditional linear forms of TV at some point in the future? Good because we might have reached that point in the future. If you haven’t heard yet, BBC3 ceased broadcasting as a traditional TV channel earlier this week and moved to a new online home, complete with snazzy new logo. The move was done as part of the BBC’s commitment to cut costs wherever they can, without alienating their youth demographic. It’s a smart move. Young people are pretty much living online these days and this could be the BBC’s chance to compete with websites like Netflix as I was talking about before. So what’s the new BBC3 (or III, I guess) like? A picture paints a thousand words. As you can see, they’ve kept the pink background and have somehow made it eye-catching and appealing (in my personal opinion, using colours like pink and yellow can make a website look garish but not here). The content itself is everything I expect from the BBC: engaging programmes aiming to inform, educate and entertain, with their picks of the day posted at the top of the page and genuine links inviting me to ‘seek their wisdom’ if I’m confused. 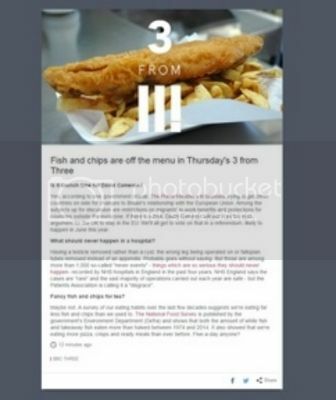 Keeping up with a web page at any given time can be a bit of a mission so one useful feature they’ve added is the ‘daily drop’, a newsletter telling us about the new content added over the last 24 hours as well as the usual smattering of tweets being read out, gossip and other articles you might expect to find on sites like Buzzfeed. Did you know that Peggy Mitchell and Kendrick Lamar are apparently both equally epic? I did not! Unlike certain other websites (looking at you, Digital Spy), I’m not getting the sense that BBC are trying too hard to win over the young people by trying to be ‘cool’ and ‘edgy’. Sure a lot of market research seems to have gone into designing the new BBC3 but I’m not seeing click bait-y list form articles trying to be viral. Instead I’m seeing short articles with titles that are making me smile and serious items that could change the mentality and attitude of the next generation. I’m blogging on a TV website so I pretty much have to talk about the new programmes on offer. Documentaries (which are surprisingly dark considering the channel has just re-launched) include Life and Death Row exploring the impact of capital punishment on young people affected by it. The first episode (if this is indeed episodic, the website isn’t clear) focuses on a young man aged 27 who is resisting all appeals to delay his execution. The description sounds like it might be trying too hard to be a true crime series in the vein of Making a Murderer but if you get over that, it sounds like a decent attempt to educate people about capital punishment. Continuing the death penalty theme, The Man Who Witnessed 219 Executions is pretty much self explanatory. Interestingly enough, this documentary is being released in daily parts before the whole thing is uploaded onto the website and iPlayer on Friday. I don’t know whether they should do that for every programme but it’s a good idea for formats such as these. Series 3 of the comedy Cuckoo is the first returning series to grace BBC3 with its presence, featuring a grumpy Greg Davies, a cool-looking Taylor Lautner in sunglasses and an infant. From what I’ve been able to gather this past week, grumpy Greg Davies seems to be the face of BBC3 at least for now. It's an interesting choice. But it could work. Other series include a Live from the BBC feature showcasing new comedians. I’m hoping they’ll expand into music similar to what BBC Introducing are doing at the moment. There’s a documentary exploring sexism in gaming, which is pretty much needed after the insanely awful ‘Gamergate’ went down over a year ago. And finally YouTuber Thomas Gray is exploring male bonding by... going on a night out in Essex? I guess the offerings from the new BBC3 can’t all be good. The website and content is a little sparse right now, probably to be expected since the site only just launched. And there are some things that are a little unclear, at least to me anyway. For example, are programmes available only for 30 days or for longer? But all in all, the website seems to be a little better than the TV channel. And besides they are asking the all-important questions nobody else dare ask. If ducks had moustaches, where would they be indeed?